Janam Ashtami Shobha Yaatra is, I think, the procession for the anniversary of Krishna, which is on September 4, and the procession through Southall last Sunday from the Shree Ram Mandir (Temple of Lord Rama) in King Street marked the beginning of the celebrations. There was a festival atmosphere, and much fine food, a little of which I enjoyed, although it’s hard to eat while I’m working. Taking religion seriously doesn’t mean always being serious about religion, and I love the enthusiasm and joyous fervour that many of those taking part display, as well as the colour and noise of the event. 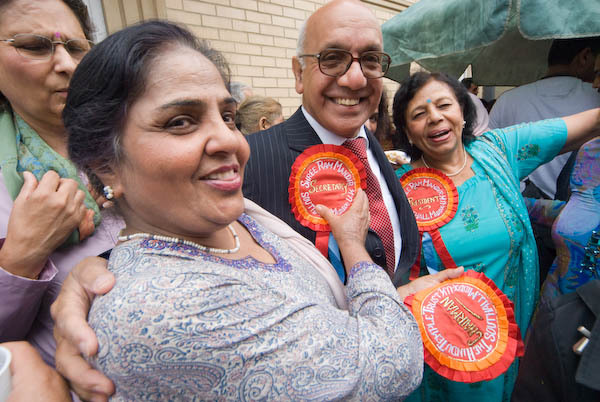 Last month, Southall elected a new Labour MP, Virendra Sharma, and he was there taking an active part in the festival, with everyone wanting to have their picture taken with him. Working on a very crowded pavement I was glad to have the 12-24mm lens on my Nikon D200 – if I stepped back at all people flowed immediately into any free space. 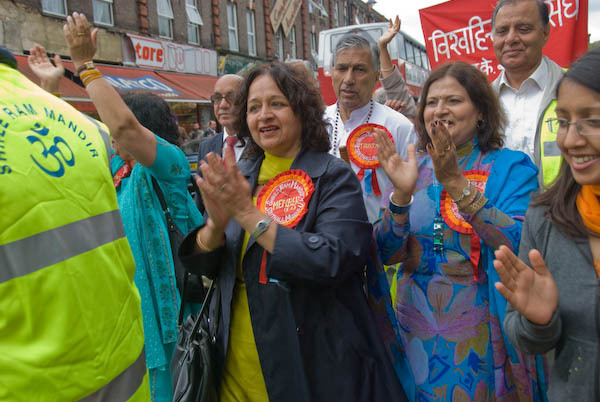 I followed the procession through the centre of Southall, taking the chance to have some more refreshments there, and finally left it as it passed the Vishwa Hindu Mandir in Lady Margaret Road, where people had come out to watch it pass. It was a drab day, threatening rain, but in Southall there was plenty of colour. This entry was posted on Wednesday, August 22nd, 2007 at 07:14 pm and is filed under My Own Work. You can follow any responses to this entry through the RSS 2.0 feed. You can leave a response, or trackback from your own site.